Game's senior producer gives us the lowdown on all things undead. Glu Mobile's Contract Killer Zombies 2 Origins represents a departure from the series' norm, as the developers chose to ditch fixed first person shooting for a free-roaming third-person romp. With this in mind, we caught up with Senior Producer Daniel Tyrrell to pick (not eat) his brain. One of the best features in this game is auto fire. What led you to make that decision? Once we committed to this style of gameplay for Contract Killer Zombies 2, we did extensive research on what feature sets have and have not worked in the past. We found that typically, the biggest problem with a free-motion mechanic is how awkward it is to coordinate aiming and shooting, all while navigating through an environment. We prototyped several styles, but the auto fire really stood out as an intuitive solution. We think it offers the user better control of movement without having to continuously tap the screen. We notice a lot of empty rooms and alleyways. What was the point of doing this from a design perspective? 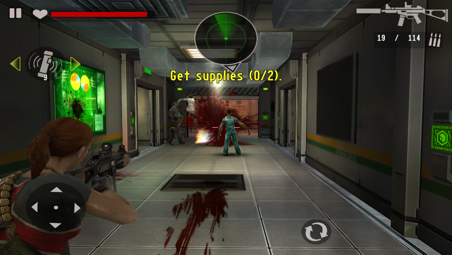 The game has a number of elements to it, including a constant exploration for supplies, ammo and bonus crates. These items are placed randomly, which adds risk/reward decision making along the mission path. It's at times difficult to gauge how far away from a zombie we should be to avoid taking damage. Is this something that could be fixed in a future update? We did not see issues with this during testing, but we appreciate the feedback, as we are always looking to improve the experience in future updates. Is there anything you had to drop from Contract Killer Zombies 2 before releasing it? What are the chances of co-op multiplayer? Honestly, the game is very close to our initial vision, but as is typical, there were some elements that we did not include at launch. Those elements will be included in future updates. Co-op multiplayer is not currently planned for Contract Killer Zombies 2. What's up with the word "Origins" in the title? How does it factor into the story? CKZ 2 tells the story of Evelyn's search for a colleague named Wallis. Along the way, Evelyn will uncover secrets behind the origins of the zombie outbreak and the role Safehaven plays in the ongoing zombie attacks.